When you visit the dentist twice a year, and see all the high tech gizmos dentists these days use to take care of teeth, it may surprise you to learn that the history of dentistry goes way, WAY back. We’re talking 25,000 years, in fact – and that’s just what we know about. It could be more! The first evidence we have of people trying to manage dental decay and fillings dates back 25,000 years. People in ancient Egypt were documenting their cavities, dental diseases and dental fillings thousands and thousands of years before you, your parents, your grandparents, and even your great grandparents ever existed. It’s pretty incredible when you think about it! In ancient Egypt, loose were either packed or filled with a composite filling material made from a combination of honey, barley, and some antiseptic. The subjects of the Pharaoh drank various syrups, mixtures and even used mouthwash to keep their teeth and gums clean, relieve pain and stop inflammation. People in ancient China also did all sorts of peculiar things to take care of their teeth. In some cases, they’d even use animal urine and feces to treat dental disorders and tooth pain… yuck! They used tea-based mixtures or spices as mouthwash to freshen breath, and made toothbrushes out of twigs and horse tail hair or the bristles from pigs’ necks. Imagine how time consuming that must have been. You probably know some older folks who have dentures to replace their missing teeth. Well, dentures have a long history, too! From ancient times until fairly recently, dentures were made from a wide assortment of strange materials, ranging from ivory and other types of bone, to wood and even human teeth that had been removed from someone else. Also up until surprisingly recently, there was really no such thing as a dentist. Instead, monks would often perform dental procedures. More recently still, it was the town barber’s job to take care of teeth, since he had all the necessary sharp, pointy instruments already. 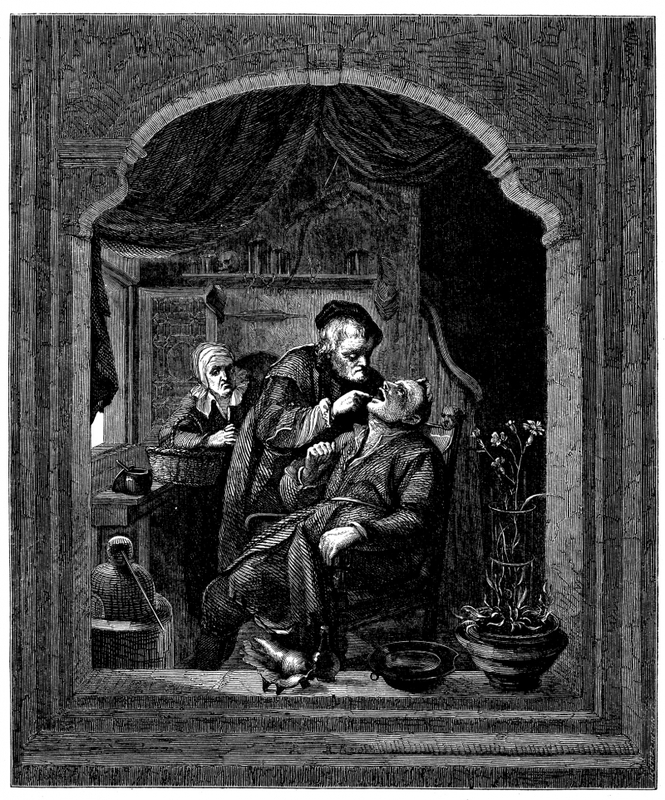 It wasn’t until the 19th century that dentistry started being treated as a serious area of medicine. The very first dental college, the Baltimore College of Dental Surgery, opened on February 1, 1840. It still exists today! Thankfully, dentistry has progressed by leaps and bounds since its early days. We have much better materials for filling and repairing teeth, more effective whitening and breath freshening agents, and the ability to perform dental procedures painlessly thanks to anesthetics and numbing agents. So next time you're feeling a bit grumpy about having to visit the dentist, pause for a moment and thank your lucky stars that you get to do it in this day and age!